None of the "patients" who were doing all of this manual labor were paid a penny. It was "training," training for a lifestyle that was rapidly disappearing and for jobs that no longer existed in the "real world." 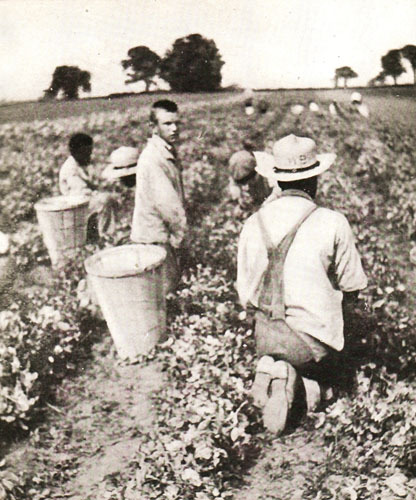 They were simply slave labor, unpaid and exploited by the institution that was abusing them and others. Your comments trying to justify this are ignorant. Please educate yourselves on this shameful period before commenting further. Occupational therapy??? Really? Honestly, that field working was a way of life for a long time, everyone did it to eat, didn't make us slaves. That was a blessing to them guys out there, they were away from poop covered floors, fully dressed, and not being attacked at that moment by other patients. Farming was the way we all ate.. These jobs didn't exist in the real world? It's almost a century later and I want to know how does fruit and vegetables get from the plant to your table? Free labor..no doubt, but I agree it probably gave them a small feeling of worth. What a despairing existence. Training? They were simply being used as slaves!! Actually, it was a kind of therapy. They were kept occupied, and it made them feel important. The raised morale meant a lot to them. Unfortunately, this program was stopped by Kennedy.